Albion, PA — Rogers Brothers Corporation will be displaying two new trailer designs at CONEXPO on March 4th through the 8th at the Las Vegas Convention Center. Visit booth #5861 in Silver Lot 3 to see ROGERS® high performance lowbed trailers. Best known in the demanding construction industry, Rogers also excels in building to customer specifications. Their modular designs offer increased versatility with detachable rear frames and interchangeable deck styles. Their custom-engineered trailers are designed to meet the needs of the transportation, oil, gas, steel, mining, utility and heavy-haul industries. 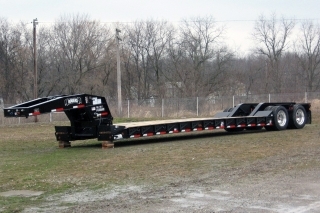 ROGERS display will include their latest 35/40-ton capacity NoFoot® detachable gooseneck trailer. This versatile trailer has a carrying capacity of 40 tons with the use of the removable/flip 3rd axle. As a tandem, the trailer is rated at 35 tons. The 24-foot platform deck is designed for a 2/3 deck length concentrated load and a loaded deck height of 20 inches. Lowered cross beams in the rear frame and at the rear of the deck allow better loading of excavators, etc. For even more versatility, ROGERS 60 to 65-ton modular trailer features interchangeable platform, I-beam and drop-side decks. The decks attach to ROGERS new CobraNeck, multiple ride height detachable gooseneck with a durable beam hook and shaft connection. It allows increased ground clearance, when necessary, while saving time that would be spent in changing deck height settings. The gooseneck is designed to accept an optional extension unit to increase the swing clearance for use with a tandem jeep dolly. The detachable rear frame is set up as a tandem with removable 3rd and 4th axles. An available booster assembly allows the unit to be configured in a variety of ways. 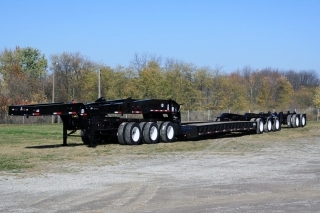 Visit Rogers Booth #5861 at ConExpo to view these high performance trailers.